This is a sponsored post with Whirlybird Granola. All opinions are my own. My family loves granola. We might have a very healthy addiction to it actually. My husband takes some to work every day for his yogurt, I sometimes have a bowl just to snack on during the day. Even Noah will ask for a bowl of granola for breakfast. Whirlybird granola is no exception. I’ve enjoyed every flavor but want to share this month because of one important thing: Whirlybird Granola is gluten free. May is Celiac Disease Awareness Month. Celiac disease is a serious autoimmune disorder that can occur in genetically predisposed people where the ingestion of gluten leads to damage in the small intestine. It is estimated to affect 1 in 100 people worldwide. Two and one-half million Americans are undiagnosed and are at risk for long-term health complications. It is important that those with Celiac disease only eat foods that are gluten-free. Whirlybird granola made it their mission to make sure it is available for those with the disease so I decided to make a recipe that is also gluten-free. None of my family has a gluten problem but that doesn’t mean we can’t enjoy something that is gluten-free and tastes delicious. Start with Caramel Sauce: Combine everything except the vanilla in a saucepan over medium low heat. Stir slowly for about 8-10 minutes (or until the caramel has thicken). Add vanilla and stir for another minute. Remove from heat and let cool slightly before putting in the mason jar. If the caramel cools too much, microwave for 30 seconds before pouring. Spray an 8x8 making dish with nonstick spray. Toss the cinnamon and flour in a large bowl with the apples making sure they are covered. 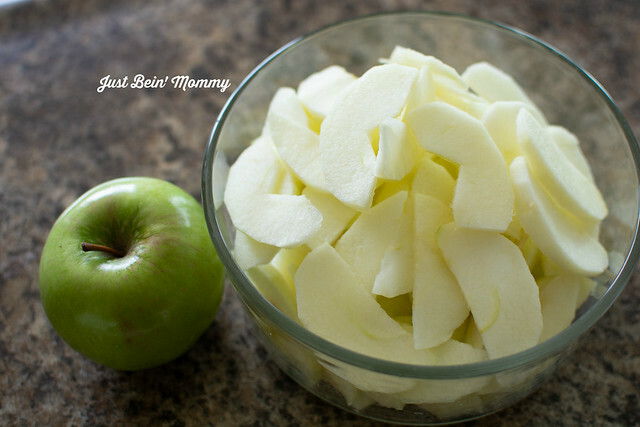 Pour the apples into the baking dish and spread out. 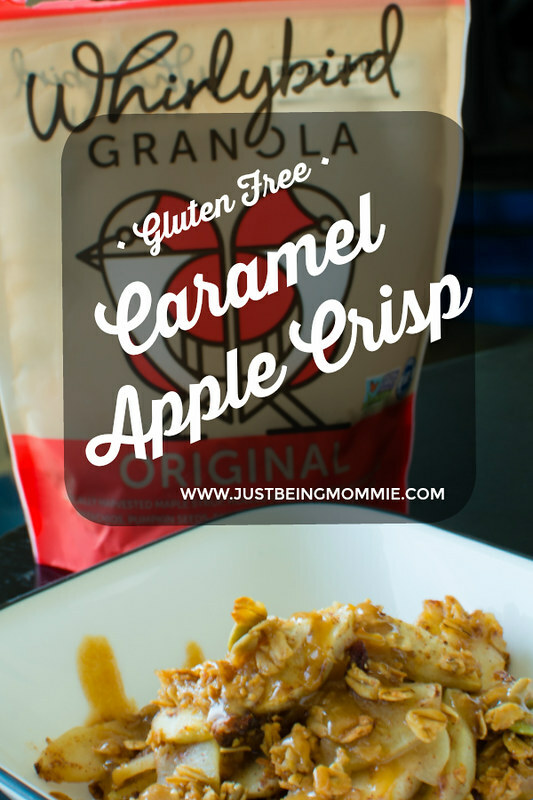 Pour half of the caramel sauce on the apples (1/2 cup). Slowly shake the granola on top. Use as much or as little as you like. Because I used a bigger baking dish, I used more granola (2 cups) but it depends on your preference. Bake for 30 minutes or until the apples are tender. Allow to cool for at least 20 minutes before serving. 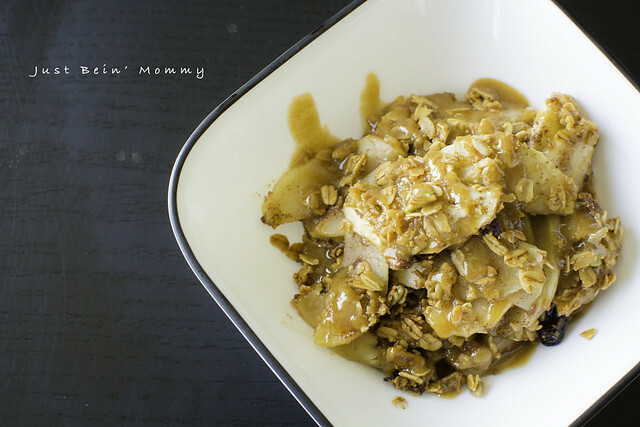 Use leftover caramel sauce to top the apple crisp. Instead of making a crunchy topping, I used Whirlybird granola’s original flavor which stays crunchy while baking and tastes amazing! And the caramel sauce gives it an extra flavor that you’ll love. Not overpowering at all. Whirlybird granola is a local business (made is Cincinnati OH) and is all-natural, non-gmo, gluten-free, vegan granola made by hand in small batches. They offer 3 flavors: Orginal, Chocolate and Vanilla Berry. You can purchase Whirlybird granola online or at your local Kroger. 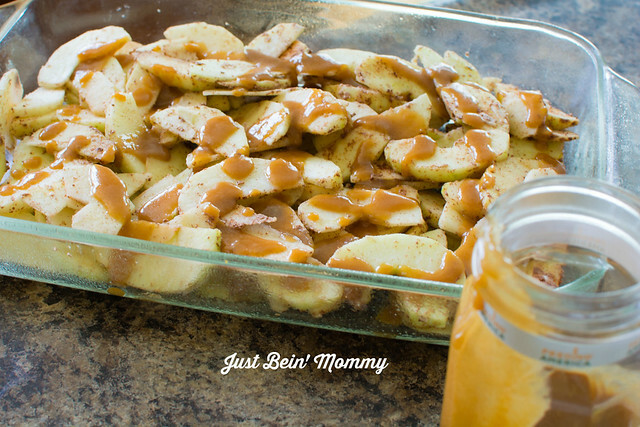 The caramel sauce recipe is from Pioneer Woman.